Melvin J. 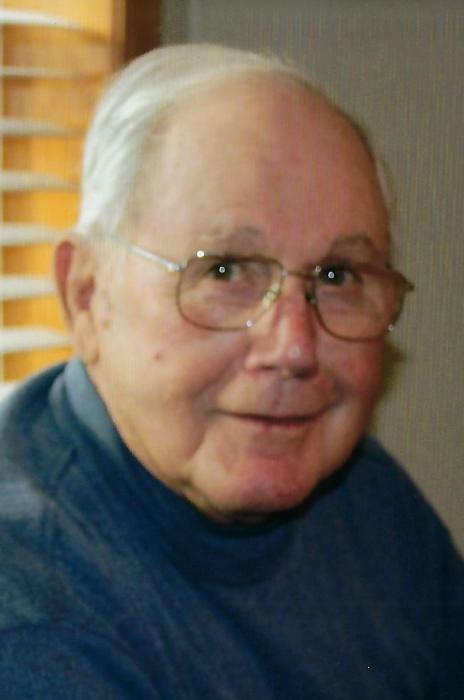 “Moon” Loes, 95, of Dubuque passed away Wednesday July 25, 2018 at home with his family by his side. Funeral services will be at 12:00 noon Monday July 30, 2018 at The Leonard Funeral Home & Crematory 2595 Rockdale Road with Fr. Douglas Loecke officiating. Entombment will follow at Mount Olivet Cemetery with full military honors accorded by American Legion Post #6. Friends and family may call from 9:00 am until the time of services Monday at the funeral home. Moon was born on July 13, 1923 in Dubuque the son of Nicholas and Lena (Wethor) Loes. He volunteered for service in the United States Army Air Corps in 1943 and arrived in England on Nov. 23, 1944. On his second mission his B 17 crew lost two of four engines and made an emergency landing in France. He went on to complete 27 missions until his discharge on Dec. 26, 1945. He returned to Dubuque and married Georgeanne Koeff on February 18, 1946. He worked as a truck driver and milk man for area dairies including Oakland Dairy, Hilldale Dairy and Swiss Valley Dairy. He also worked as a school bus driver and lastly worked at Lacoma Golf Course keeping the golf carts running. Moon was an early member of the Key West Fire Department and achieved the rank of Assistant Chief, he was also a member of the American Legion Post #6 and was on one of the first Honor Flights to Washington DC. He is survived by his three children Ken (Gwen) Loes of Geneva, IL Sue Manternach of Cascade and Mona Manternach of Dubuque, a former son-in-law Greg Manternach, twelve grandchildren and 25 great grandchildren. He was preceded in death by his parents his wife Georgeanne on March 14, 2015, three brothers Leonard, Joseph and Carl and a sister Rita (Ralph) Linden. In lieu of flowers a Melvin “Moon” Loes memorial fund has been established. The family would like to thank the staff at Eagle Point Place especially Sara, Brandy, Kim, and Jean, and Dr Mark Moore and Dr. Eric Engelman and their staff along with Hospice of Dubuque for all the compassion and care.